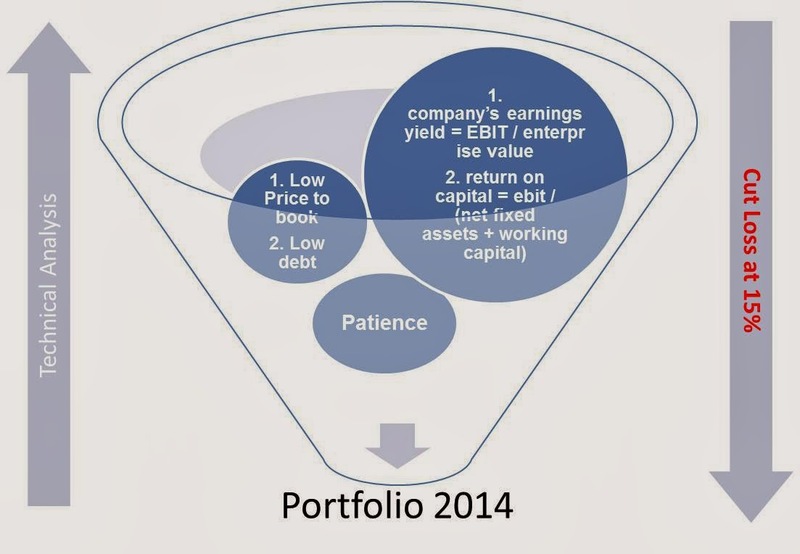 Just my thoughts on investing: What is your investment strategy for 2014? While I was surfing(usual routine) for information to reinforce my financial knowledge, I came across a video about this value investor, Joel Greenblatt. Apart from being an investor, he is also an adjunct professor at the Columbia University Graduate School of Business. He devised a system which he had faithfully used and as a result, a book that he has also written - 'The Little Book that Beats the Market'. To most of the people, his system was known as the 'magic formula'. So what is this 'magic formula'. The 'magic formula' is a simple set of system, which I like, as most of the readers know that I like to keep it simple. To most of the folks who read or watch about him, most would have known of the 2 criteria, which helps one to select good companies at bargain price. However, there is also the 3rd most important criteria which he mentioned repeatedly in the video above, Patience. And, yes, most of the retail investors wanted to make a quick profit from the market and most of the time, they are more excited with counters where lots of other people are talking about. If you want to know more about him, there are lots of information and videos in the internet, so I will not share more here. What I want to share is now I have another selection strategy which is simple to execute and a proven track record. Below is what I will be using in 2014 and longer if it make sense. In the funnel, you have the selection criteria from Walter Schloss and Joel Greenblatt. The funnel basically provides the guide to what to buy, and the TA tells you when to buy and cut loss. But these people never share the how, and this strategy, though boring, addresses the above and keep your risk lower than most people around you. Secondly, on Greenblatt's formula, what's your view on using EBIT rather than EBITDA? EBIT penalises capital-intensive businesses but we know better that EBITDA is likely a better proxy for operating cash flows. Third, Greenblatt's approach involves ranking of companies based on ROIC and earnings yield and then picking the best ones. Are you doing so or you have an absolute "hurdle" rate to base your stockpicking? I like your strategy, but I find it hard to reconcile cutting loss at 15% when you have patience as one of the bubbles. If your investment case is well-established prior to purchase decision, barring new facts, I assume any drop in price should be interpreted as "I bought in too early" and presents further buying activity. Why mechanically cut loss? We should be..patient? Good blog, following you sir. Hi Henry, thanks for visiting. No there is no meaning on bubble size, can't fit the font size that's all ...haha. I don't go so deep, just keep it simple and follow the proven formula. As mentioned, entry price also based on TA, and with this, if it heads the opposite direction, then one should cut loss. It does not mean that we are not long term, it just mean that we are wrong, period. Thanks.